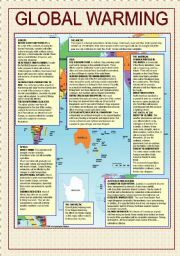 Some texts on global warming adapted from a local newspaper, plus some vocabulary and reading comprehension questions. KEY on the third page. (By the way, I´ve been through all the tutorials, thanks a lot to everyone!). 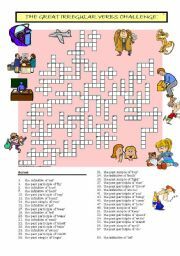 A new crossword for level 3 with past simple and past participles. Answer key included. 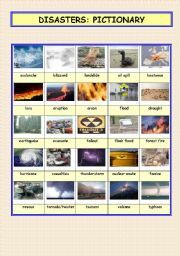 A simple pictionary to learn the vocabulary related to disasters. Students have to match the activities to the pictures. 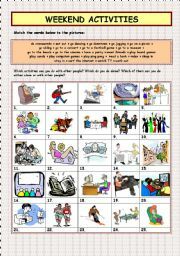 It can be used for several speaking activities. Still another attempt to help them learn the list; just the simple past, in this case. 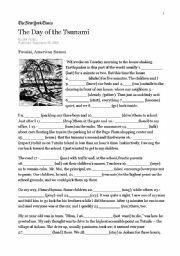 A simple matching activity with vocabulary to speak about holidays. 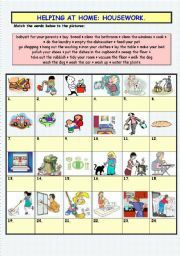 A matching worksheet focused on the most usual vocabulary for housework. A powerpoint with exercises to elicit the form ´have something done´ (animated). It goes with my printable http://www.eslprintables.com/printable.asp?id=398570#thetop, but obviously it can be used on its own. Answers appear on screen by clicking. Students are given clues and they have to produce a suitable adjective of personality/character. 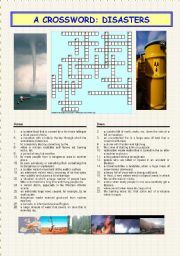 A PPT to present the topic dealt with in my worksheet http://www.eslprintables.com/printable.asp?id=398998#thetop, (it does not include the exercises). It deals with the topic of climate change and global warming. An interactive PPT designed to promote oral production in the classroom, to practise object pronouns. Step by step slides where sts. have to produce the language before the answer is shown, followed by a fill-in exercise with visual clues. Students look at the slides, define the problem and give advice using ´He/she should/shouldn´t...´. They can also give a reason. This powerpoint is for fluency practice and oral work. A visual guide to the most common food idioms. Pictures are used to associate content; the idiom appears at the first click and the definition/explanation at the second click. I hope you like it! An animated PPT to compare and contrast the use of the two tenses. (The animations are intended to make clear the actions happening NOW). Students have to produce the correct tense orally before you click for the answer on screen. The presentation works in three stages through animation: first, students read the definition and try to guess. They check with 2) the image -which will also help if they haven´t guessed. And in 3) at a click the word appears. 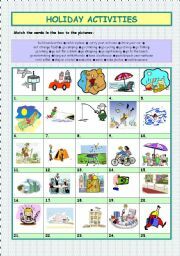 a very simple PPT to practise vocabulary related to free time and hobbies.